"She has been given a second chance to live free in the forest, where she belongs." A 30-year-old orangutan was weak and could hardly see when she was found on a palm oil plantation in North Sumatra, Indonesia, desperate for help. What she endured can only be deduced from her wounds: Rescuers found air rifle bullets in her face. One had even lodged in her eye, causing partial blindness. But she was determined to survive, despite what must have been a horrifying seven days, or even longer, during which she was isolated on the plantation. Rescuers from the Orangutan Information Center (OIC), along with local park officers, found her malnourished and scared. Still, she was determined to get back to the forest as soon as she could. Rescuers gave her a health check to make sure she would be safe if they let her go. The jungle in Indonesia is rapidly diminishing because of logging and the palm oil industry. Because they're losing their habitat, orangutans are now classified as critically endangered by the International Union for Conservation of Nature (IUCN). As the palm oil industry expands, orangutans are coming into more frequent contact with people who see them as a nuisance - and we are increasingly facing a future in which these animals could be gone forever. To add to the problem, some locals even capture baby orangutans and take them into their homes to keep them as pets. Other orangutans have difficulty finding food after the forests are cut down, and end up starving. 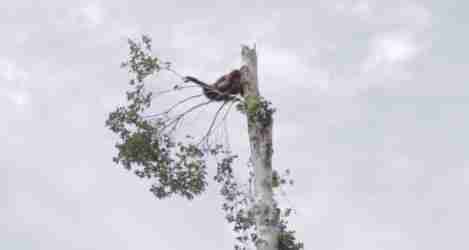 Luckily, this orangutan avoided what could have easily been a terrible fate. "This beautiful Sumatran orangutan was healthy enough to be directly released into the Leuser Ecosystem on the very same day," the Sumatran Orangutan Society wrote on Facebook on Friday. "She has been given a second chance to live free in the forest, where she belongs." To help give more orangutans second chances, you can make a donation. Another way to help is to avoid buying products that contain palm oil.